The Brix Collection 4 variety gift box set come in a gorgeous "book" containing milk, smooth dark, medium dark, and extra dark 4oz. bars, based on the best cocoa from Ghana. The box is closed with a Brix Chocolate for Wine wax stamp. When you open the box, you're greeted with four chocolate bricks and a bit of an explanation of each. You are told what wine pairs with each bar and a few tasting notes. "The sweeter chocolate pairs with sweeter wines (like milk chocolate with Ice wine or raisling)." 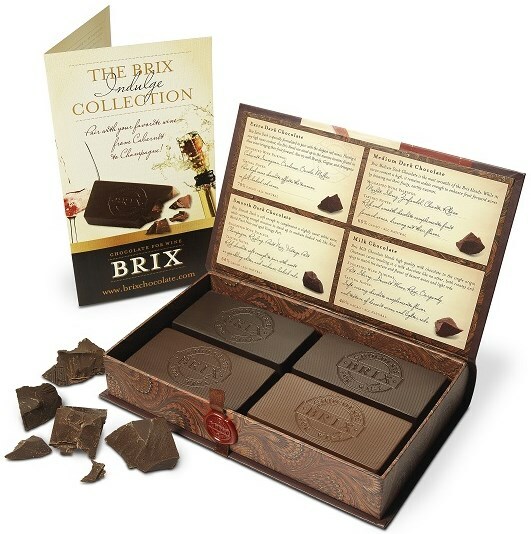 The Brix Collection is a party favourite and a perfect hostess gift. Once all the chocolates have been devoured the gift box is the perfect keep-sake hallow book! The 4oz brick is meant to be fractured like a hard cheese into discreet, luscious bites to be enjoyed with your favourite wine. Move over cheese...wine has found a new love!